I had a wonderful journey with Let’s Get Lost! I read it in one sitting, for about three hours. It was heart-wrenching from the moment you pick it up, and never stops being angsty and romantic. until his own goes off-script. And Sonia, who worries that she’s lost her ability to love. Also how great is this fanart??? This book is formatted into 5 chunks. 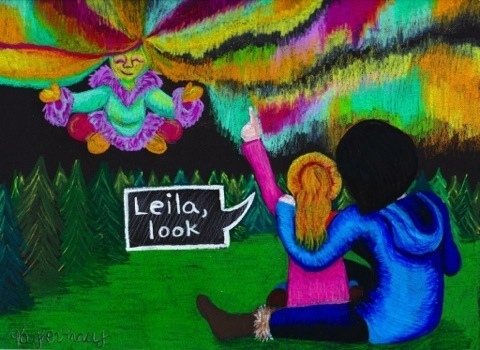 It follows Leila’s road trip heading “North”, to see the Northern Lights/Aurora Borealis. Each chunk (as I so eloquently phrased), is a short story with an encounter from a new angsty teen. It was very cliche but warmed my heart. This amazing blog mapped out the journey. Discovery, journeys, belonging, the future, love, loss, hope etc. + any other buzzword you can think of in a sappy novel/movie. HEA insured! YAY! It ends with (view spoiler)[Hudson and Leila finally seeing each other again, (hide spoiler)] however I’m sad we do not get to see the rest of the hitchhikers. This book was profound and will leave me thinking about it for a long time. I loved every theme and issue and crisis that was mentioned in this book, and I think it should be a necessity for all teens to read it (though I’m sure some would find it too pretentious and cliche to enjoy). Ahhhh sounds cute! *adds everything to tbr* i need a light romance to get into so i’ll definitely check this out! how’s reading going for you?